Click here for the Sealey instructions PDF file. Click here for the Sealey Parts PDF file. Designed to prevent damage to the underside of the vehicle's jacking point. 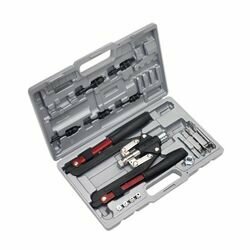 One of a comprehensive range of Sealey Hand Tools, suitable for daily use. 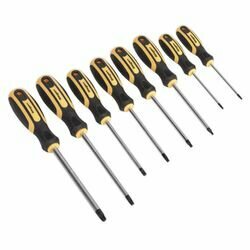 Chrome Vanadium steel shafts with blackened finish and classic styled handle. 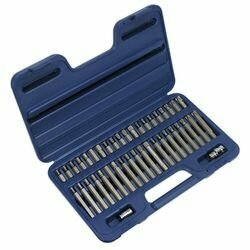 Set includes 3/8" and 1/2"Sq drive to 10mm hex Chrome Vanadium steel bit adaptors. 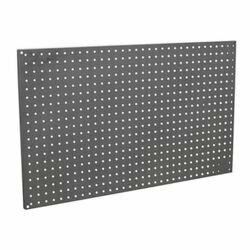 Steel panel comprising of four 430mm rails and clips suitable for retaining 1/4", 3/8" and 1/2"Sq drive sockets. Drop-forged frame with patented folding mechanism for compact storage. Comfortable cushion grips. 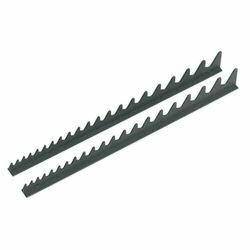 Suitable for installing threaded centre rivets for securing threads in thin sheet material. 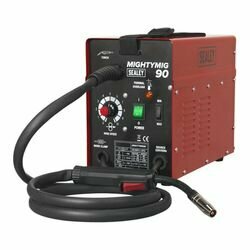 Heavy-duty head suitable for threaded rivets up to M10 capacity. 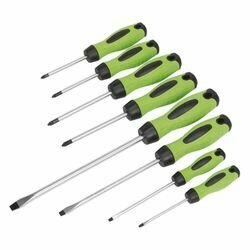 Suitable for aluminium, steel and stainless steel threaded rivets and blind rivets. 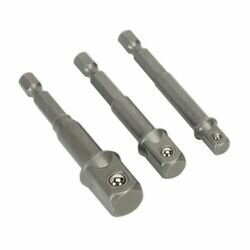 Suitable for rivet nuts in aluminium, steel and stainless steel. Highly durable die-cast aluminium alloy pump head. 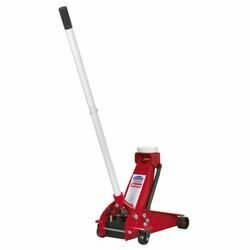 Features 3-way fill with cartridge, bulk or manual capability. 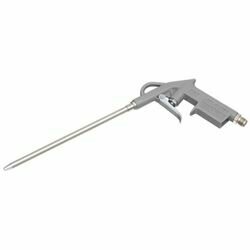 Fitted with 2-way operating extendable handle; pistol type, ideal for use in confined spaces and lever type, providing high pressure and volume. 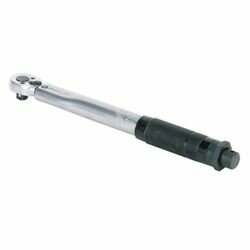 Supplied with rigid delivery tube, push-on hydraulic 4-jaw coupling and 300mm flexible delivery tube. 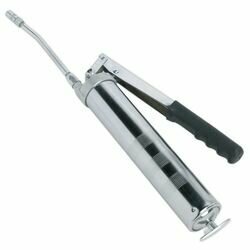 Rubber gripped grease tube and handle for easy grip. 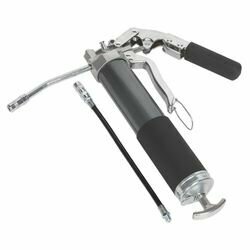 Features variable stroke for controlled grease volume; half stroke gives low-pressure/low-volume, full stroke provides high-pressure/high-volume delivery. 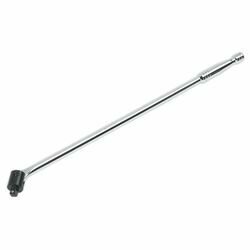 Single action composite bodied suction tube with T-bar type plunger. 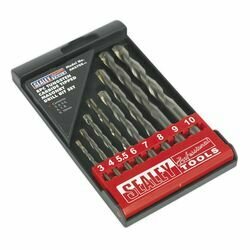 Fully ground HSS with 5% Cobalt makes these ideal for drilling extra hard materials. 135° Split point tip enables bits to bite workpiece quickly, reducing the need for centre mark. Drills can be re-sharpened without affecting their performance. 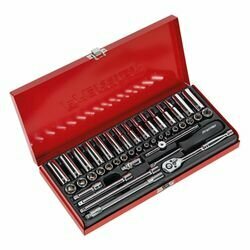 Manufactured from hardened and tempered Chrome Vanadium steel with 1/4" hexagon shanks. 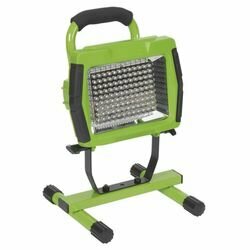 Ideal for use with all electric/air drills. 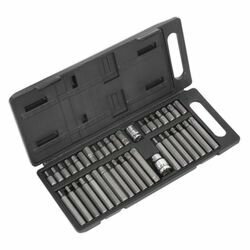 Suitable for repetitive applications which require 1/4", 3/8" or 1/2"Sq drive sockets. 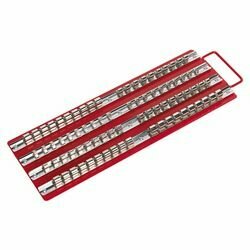 Chrome Vanadium steel extension bars and adaptors. Chrome Molybdenum steel universal joint. Phosphate finish for added corrosion resistance. Suitable for use with any impact tool. 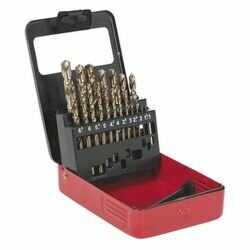 1/2"Sq Drive Chrome Molybdenum steel bit holder with S2 steel bits. Tungsten carbide tipped for prolonged life and heavy-duty use. Shank features a special flute design for fast and effective waste removal. Set covers sizes from 3 to 10mm. 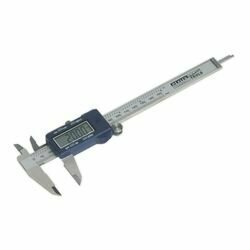 Every wrench is tested and supplied with an individually numbered test certificate. 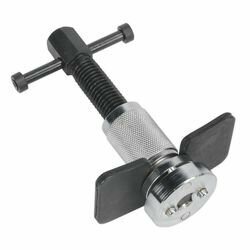 Micrometer type torque range adjustment with scale graduated in both lb.ft and Nm. 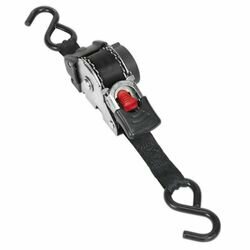 Stubby, compact configuration and 45° offset WallDrive rings give improved access in confined spaces. Combines the most common fastener sizes (10 & 13mm). 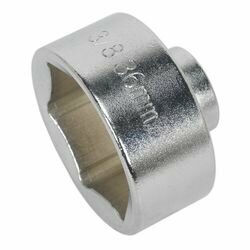 Essential for rowers as a rigger jigger, undoes every nut in a European boat - 10mm for riggers and 13mm for top nuts. 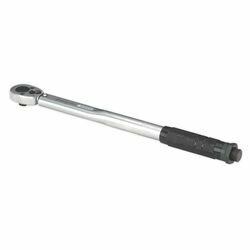 Flip reverse gear-to-gear ratchet with quick socket release. Long, slim style handle with spring loaded socket retention. Fully replaceable knuckle joint*. 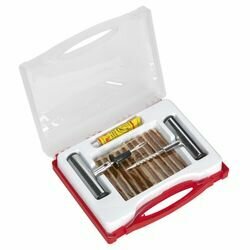 *Note: Knuckle joints are not covered by the lifetime warranty and are treated as consumable items. 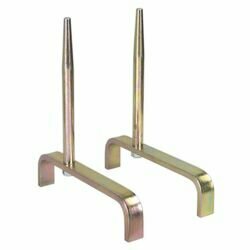 Hardened and tempered Chrome Vanadium steel bars with a coloured high chrome finish. 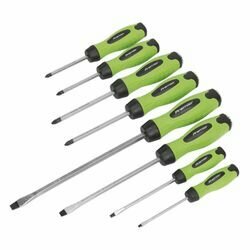 Long, slim style handles and spring loaded socket retention. Extra thick, highly absorbent, 100% cotton head. 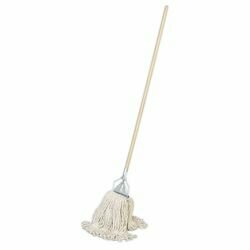 Features straight grained wooden handle with metal locking clip. Durable composite housing operated by simple pull and release action. Features integral manual thermal trip switch to prevent overload and LED power indicator. 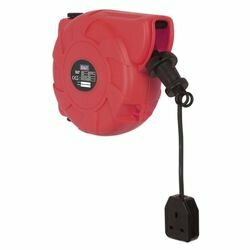 Supplied with single socket outlet. 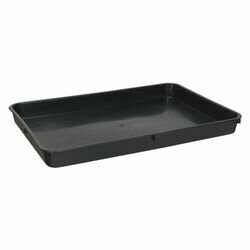 Low profile drip tray is manufactured from hard wearing recycled polypropylene. 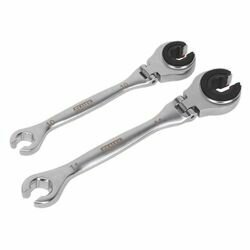 These have a broad appeal to both the classic car user and general mechanic. Purpose made for the recovery of oil and fluids, this drip tray can be left under most vehicles due to their low profile design. 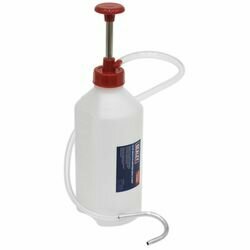 Ideal for use over prolonged periods of time, catching any drips that may occur whilst in storage or in the workshop. 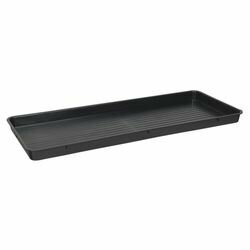 Purpose-made for the recovery of oil and fluids, this drip tray can be left under most vehicles due to their low profile design. Extra long in order to cover drips from both engine and gearbox. 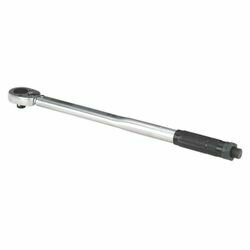 Ergonomically shaped handles maximize power transfer from hand to fixing. 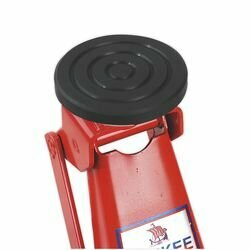 Feature hi-visibility handles with hanging hole for safe storage. 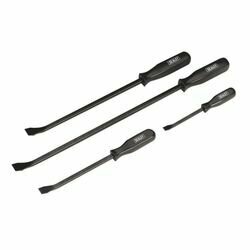 Hi-visibility textured handles with hammer cap. Includes hanging holes for safe storage. This unit is set up ready to go. 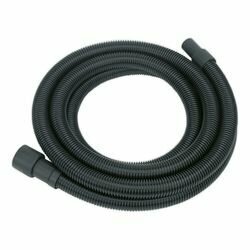 Supplied with comfort grip non-live torch, 2mtr earth cable, welding mask, 0.2kg flux cored wire and 0.9mm contact tip. 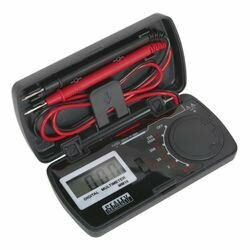 Handy compact unit, small enough to fit in your pocket, making it ideal for basic circuit testing whilst on the move. Features flip lid for added screen protection and storage of leads. Conforms to EN 61010-1 CAT II safety requirements. 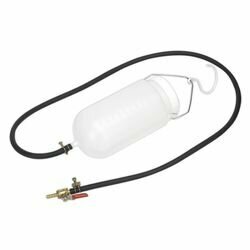 Must have item, when needing to remove fuel tank to perform maintenance on your motorcycle. 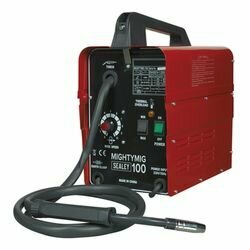 A brilliant tool for the auto electrician and mechanic. Fitted with 4.5mtr cable allowing access to the rear of the vehicle and supplied with instructions. 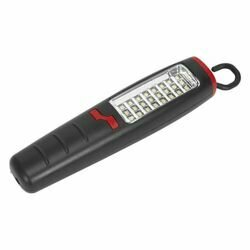 All the features of the PP1 Auto Probe but with an integral work light to aid use in dark engine bays plus an audible circuit tester for when the LED on the probe cannot be seen. Fitted with a sensitive short circuit protection device. Safe to use around vehicle’s electronic management systems. Power switch self test means no need to: - Double check your circuit, tester on the vehicle’s battery. 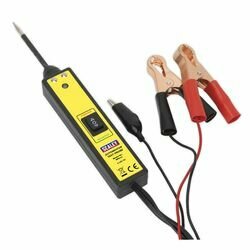 - Reconnect hook-up clips to test polarity. - Search for earth points. - Burn out fuses locating faults. 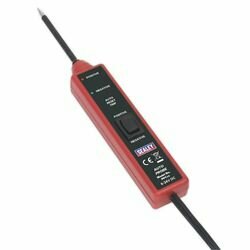 - Run voltage drop tests. Fitted with 4.5mtr cable allowing access to the rear of the vehicle and supplied with instruction guide. 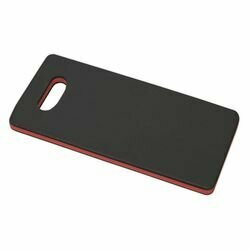 • Manufactured from non-slip durable rubber. 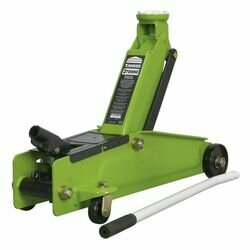 • Designed to secure pallet truck wheels to eliminate freight and vehicle damage due to unsecured pallet trucks while in transit. 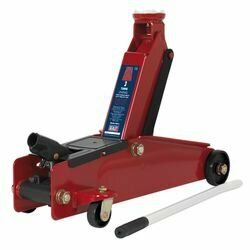 • Ideal for delivery companies and other material handling applications. Amorphous solar panels convert daylight directly into 12V electricity. 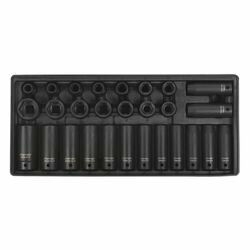 Suitable for maintaining charge in a wide range of batteries and power packs. 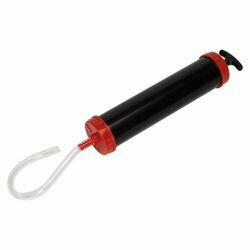 Ideal for batteries stored in boats and caravans and for batteries in vehicles in long-term storage. Advanced technology solar panels require only daylight to generate power. 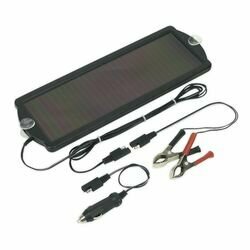 Supplied with battery clips and vehicle accessory socket plug. 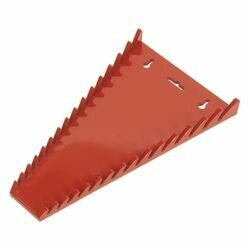 BS EN 166/B - Manufactured from polycarbonate for superior durability and resistance. 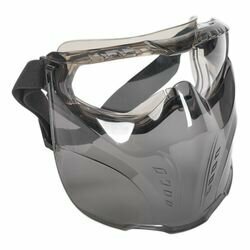 Offers full face protection with an increased range of mobility compared to a standard face protector. Curved face shield conforms to the shape of the face offering improved protection. 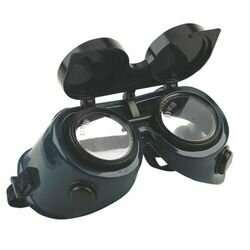 Detachable indirect goggles to allow for extra versatility. Features a wide angle curved lens for enhanced visibility. Adjustable headband with soft PVC frame provides added comfort. 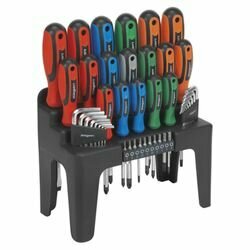 Suitable for automotive, workshop and factory use. Preset track, peak or desired torque levels using simple push-button menu. Selectable read-out in Nm or lb.ft. Accurate to ±1% of stated capacity. Textured, contoured handle for added grip and comfort. 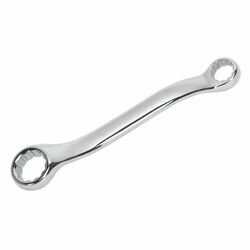 Wrenches are individually tested to standards with ±4% accuracy and each wrench is issued with an individually numbered test certificate. Suitable for heated and unheated oxygen sensors. 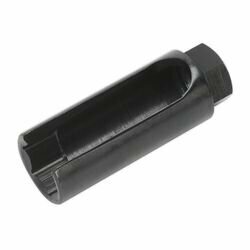 Low profile design enables use on cartridge style filters. 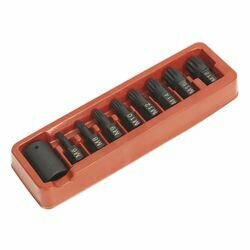 Tool Tray with 28pc 1/2"Sq Drive Impact Socket Set. 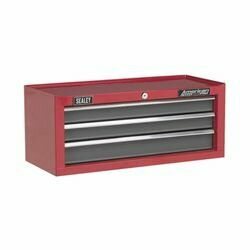 Suitable for AP24 Series and selected Superline PRO Tool Chests. Multipurpose pump perfect for topping up difficult to access points on motor vehicles, lawnmowers, chainsaws and other jobs around the workshop and home. 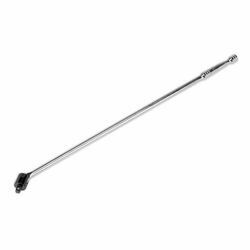 Supplied with Ø5.8 and Ø6.7mm sprung steel lined suction probes and a Ø9.8 x 1mtr extension tube. Internal float valve for automatic cut off when unit has reached maximum capacity. Unit can be tipped 90° for easier emptying. Ideal for repairing punctures on tubeless tyres fitted to agricultural and off road vehicles. Can also be used as a temporary/emergency fix on cars and commercial vehicles. 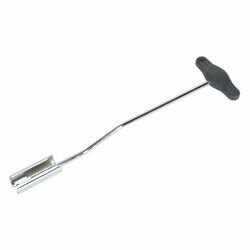 Allows the tyre to be repaired without removing the tyre from the wheel. Not to be used as a permanent repair for road vehicles. Suitable for use with Model No's PC200, PC200SD, PC200SDAUTO, PC200SD110V PC300SD, PC300SDAUTO. Enables retraction of the piston on rear brake calipers allowing new brake pads to be installed. 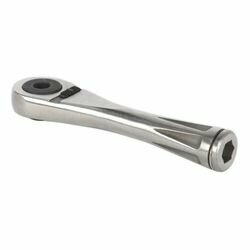 Features 72-tooth ratchet with flexi-head for limited access applications and fixed head for initial loosening of the nut. 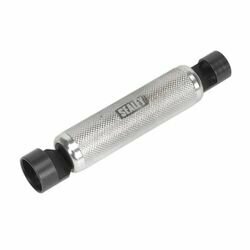 Ideal for most brake pipe fittings. Designed to aid installation and removal of large and small T-slot anti-rattle washers found in drum brake assembly. Features large viewing cut-away to allow correct alignment of washer. Simple push and twist action. A pair of support stands which locate into cylinder head via stud holes. Also provides the clearance between head and workbench required when reaming valve guides. 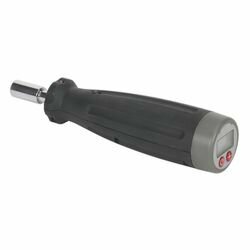 Multifunction diagnostic tool used to test a variety of essential engine and associated functions including fuel, ignition, transmission and emissions. 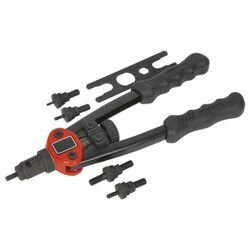 Kit also includes reservoir, hoses and adaptors for bleeding brake and clutch systems on cars, commercials and motorcycles. 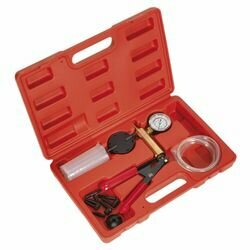 Brass-bodied vacuum pump features large, easy-to-read vacuum gauge calibrated in both inches and millimetres of mercury. Separates the HT leads from the deep-seated spark plugs fitted to VAG vehicles. Essential tool for spark plug removal. 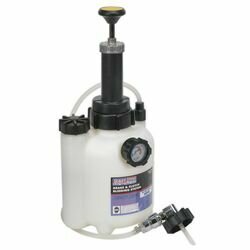 Pump operated oil dispensing unit with a three litre capacity. 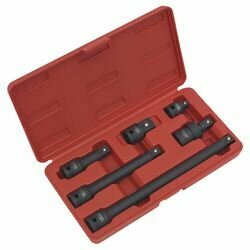 Supplied with five multipurpose and three vehicle specific automatic transmission fluid adaptors. 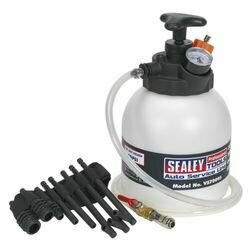 Features a fluid control and depressurising valve. 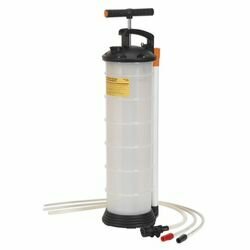 Reservoir holds 2.5ltr of hydraulic fluid - flush the entire system with one fill, without the risk of running the reservoir dry. Fitted with Ø42mm cap with 90° angled connector which is suitable for most European models. 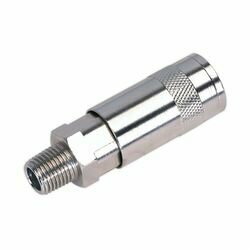 For other applications, order optional Brake Reservoir Cap 42mm Straight Connector - Model No. VS820SA, Universal Adaptor - Model No. VS820UA and Bleeder Cap Set - Model No. VS0204B. Quality 28mm EVA kneeling mat ideal for the busy mechanic. 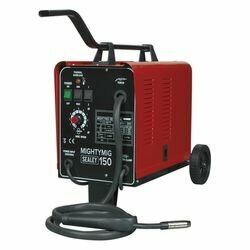 Suitable for use on workshop floor when working on wheels, brakes, tyres and exhausts. For VAG 1.4D, 1.9D, 2.0D TDi PD (Pumpe Duse) and 1.2D, 1.6D, 2.0D CR (Common Rail) engines with Mechanical (Friction Dampened) Belt Tensioner. 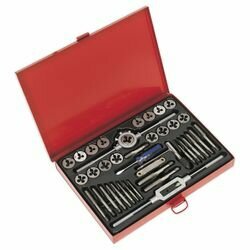 Kit includes crankshaft locking tools (oval and round gears), plus camshaft and tensioner locking pins. Use with Associated Tool - Model No. 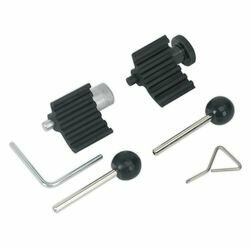 VSE5752 Tensioner Adjuster Set. 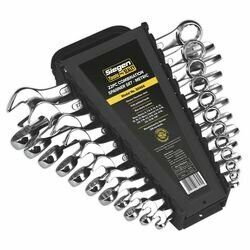 Durable composite sharks teeth spanner rack helps maintain an organized topchest/rollcab. 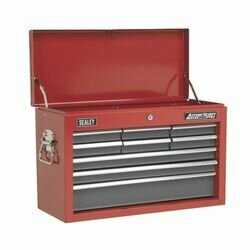 Durable composite spanner rack helps maintain an organized toolbox or workstation. Can also be carried or hung on a wall.